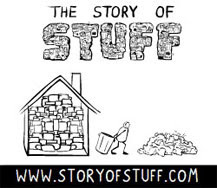 when you have twenty minutes to spare; click on storyofstuff.com and click play. this is our planet. it's time to step it up. I used to crush my yogurt cups and worry about folding down the carboard cereal boxes and all that until I found out that my landfill incinerates all our garbage. Our landfill.. which is actually called an Energy Reclamation Center is really amazing and it doesn't even smell bad there. After they incinerate the garbage they pull out all the metal to be recycled. It's very cool. Hyper consummtion is not a good thing for being green or the budget either I suppose.. but, before you get too worried find out what is being done in your area. I bet you'll be pleasantly surprised like I was. Thanks, I'll have to watch this. It is a curse. I can never throw away a plastic bag in good consciousness. It drives me crazy... Why can't I just throw away garbage like everyone else? Thanks for spreading the word about all this. It is one step at a time...if we took a step a day things would happen so quickly. How true (and sad)! Thanks for posting this! I will re-post it on my blog too! proud to wave the banner, albeit tiny, of "less stuff." I feel lighter and happier when my environment is lighter. It helps to live in a small-ish home. The video is great. I'm going to share it!